The Ukrainian president briefed his colleagues on Donbas. President Petro Poroshenko, German Chancellor Angela Merkel and French President Emmanuel Macron have discussed the release of Ukrainian servicemen held by Donbas militants and political prisoners detained in Russian prisons. Poroshenko said this at a briefing after their meeting in Aachen, Ukrinform reported. "We also discussed the humanitarian component, including an exchange of hostages held in the occupied territory, including Ukrainian servicemen, and political prisoners illegally detained in Russia. A clear list of names was discussed," "Poroshenko stressed. According to the Ukrainian president, the leaders of France and Germany support Ukraine's position that the Minsk agreements cannot be implemented without the introduction of a UN peacekeeping mission. "As the practice shows, the security component of the Minsk accords cannot be implemented without a full-fledged peacekeeping mission in occupied Ukrainian Donbas. "I would like to note that both the German chancellor and the president of France supported Ukraine's position, just as our American partners did," he said. Poroshenko informed the leaders of Germany and France about the escalation of hostilities by Russian-terrorist forces in Donbas. The three also agreed to check notes on the agenda for the next meeting of the Normandy group (France, Germany, Russia and Ukraine), which may be held in Paris. Poroshenko pointed out that the agenda must be thoroughly prepared to ensure effective negotiations. 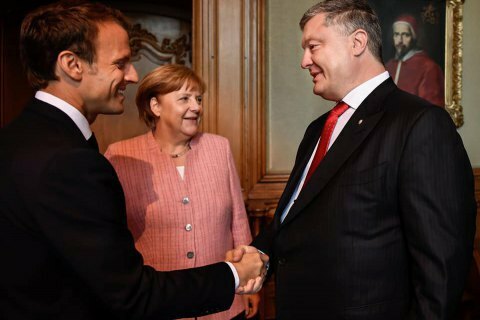 Poroshenko met Merkel and Macron as part of his working visit to Germany on 9-10 May. On 18 and 23 May, European leaders will meet Russian President Vladimir Putin to schedule the next negotiations in the Normandy format. The last meeting in the "Norman format" at the highest level was held in October 2016 in Berlin. After that, contacts continue at the working level. Last time the presidents met in the Normandy format in Berlin in October 2016. Contacts have been held at the level of working group since.